The Monterey Bay Aquarium (MBA) is an aquarium and marine conservation center on Cannery Row in Monterey. Housed in what was once a bustling sardine cannery in its time, the Aquarium is home to more than 600 species of plants and animals, the center displays the marine life of the California coast. Established in 1984, the Monterey Bay Aquarium is located on Cannery Row in what was once a former sardine cannery. After the collapse of sardine fishing in 1973, the cannery was taken dismantled and taken over by the Monterey Bay Aquarium. Designed by Esherick Homsey Dodge and Davis, the aquarium was built in honor of the work of marine biologist, Edward Ricketts (1897–1948) who specialized in describing communities of organisms. The aquarium honors Ricketts’ life works with a display of items from his personal library and other memorabilia. The aquarium received initial financial backing from David Packard, the co-founder of Hewlett-Packard, who also designed and built several exhibit elements at his forge in Big Sur, including the aviary and the wave machine in the Kelp Forest. The mission of the aquarium is to ‘inspire the conservation and preservation of the oceans’ and is currently directed by Packard’s daughter, biologist Julie Packard. 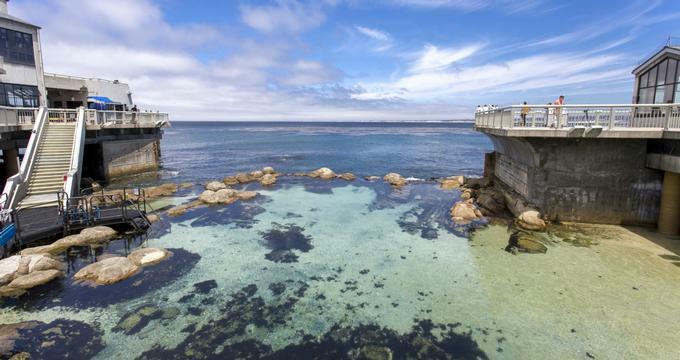 The Monterey Bay Aquarium is home to thousands of plants and animals, representing over 600 species in various habitats and marine environments. The centerpiece of the aquarium is the Ocean's Edge Wing, a is a 28-foot-high, 333,000-US-gallon pool-like exhibit that showcases a variety of Californian coastal marine life and California Giant Kelp. The largest exhibit in the Aquarium is the Open Sea exhibit – a 1,200,000-U.S.-gallon pool with huge single-pane windows that allow visitors to experience the deep ocean by almost being in it. One of the few aquarium exhibits to successfully house and care for ocean sunfish in captivity, the Open Sea also features large game fish, such as Yellowfin and Bluefin tuna, stingrays, sharks and other deep sea fish and animals. The Black-Footed Penguin exhibit was opened in 2000 as part of the Splash Zone family galleries area and features a double story enclosure with nine breeding pairs of Black-Footed Penguins, as well as a variety of other penguin species that were rescued from Hurricane Katrina. The Viva Baja! Special Exhibit showcases the colorful sea creatures that call the coast of Baja California home. The Viva Baja! Special Exhibit’s diverse terrestrial habitat also features tortoises, snakes, lizards, scorpions, and tarantulas which live in the region’s sun-scorched deserts. The exhibit also presents a section on the conservation of the area on both sides of the border and how to work is being done to preserve the region, and it’s animals, in particular, the vaquita, which is the most endangered marine mammal in the world. The Viva Baja! Special Exhibit also offers fun, interactive experiences such as a unique auditorium program that follows the migration of gray whales, elephant seals and brown pelicans to the protected beaches of Baja. The Monterey Bay Aquarium takes part in several conservation and research projects. The aquarium conducts research on Pacific bluefin tuna, great white sharks, sea otters, two of which it also houses from its Sea Otter Rescue Program, to better understand these species. Other species that are on the conservation list of the Aquarium include rays, cookie cutter and seven-gill sharks, ocean sunfish and Humboldt squid. The staff at the Monterey Bay Aquarium study these animals’ migration patterns, food requirements, population dynamics, and the threats they face in the wild to conserve the species. Other projects include the rehabilitation of shorebirds, a plover recovery program, and Seafood Watch, which offers helps consumers choose sustainable seafood. The Monterey Bay Aquarium offers a variety of educational programs for educators and students of all ages, ranging from field trips and ocean explorer guides to classroom resources, games and activities, homeschool days, teen programs and project-based science programs. The Monterey Bay Aquarium is located at 886 Cannery Row in Monterey and is open to the public daily from 9:30 am to 6:30 pm. Visitors can enjoy behind-the-scenes tours of the facility and all its creatures led by knowledgeable aquarium staff, and the Aquarium Café serves a delicious menu of healthy cuisine, snacks, and beverages during the aquarium’s opening hours.